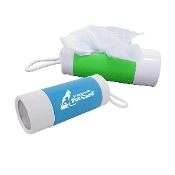 Includes 10 biodegradable white waste bags, 3 replaceable LR 1130 button cell batteries, twist activated light and carabiner clip. Price includes a screen printed, 1-color on one location imprint. Size: 4" x 1-1/2" D.
Imprint Area: 1-1/2" x 1".